DISCLAIMER: NAKIVO is a sponsor on this site as of the time of this writing; although this is a sponsored post, the words and impressions below are my own. Earlier this week, the much-anticipated 7.4 Beta of NAKIVO Backup & Replication was released. Although it is still in Beta, there are quite a few new features that were shipped with it. I grabbed a copy to play around with and I wanted to cover what I thought were some noteworthy features. Before I jump into that, I want to give kudos to NAKIVO for having a nice selection of download options. In my case, I opted for the Windows install, but seeing support for other platforms is always very welcome. Having a way to recover data from backups is absolutely essential, but as businesses grow, so do their needs. Having a way to automate DR tasks becomes just as important. In this day and age, DR sites have become much more affordable and commonplace. Due to virtualization in general and public cloud offerings, most organizations can find something that fits their budget. The downside is that there can be added complexity. Replicating machines to your DR site is something that NAKIVO has offered for a while now. But 7.4 is offering something new. VM Failover jobs are now available as an option. What’s great about these is that they not only handle the spinning up of remote machines, but they allow for re-IP’ing of those DR machines. Commonly, most organizations have their DR network on a different subnet from production. Re-mapping those IPs manually can be a nightmare, and error-prone. Having this step taken care is a huge improvement to the process, both from a speed standpoint, as well as from a consistency standpoint. In larger environments with complex infrastructure, sometimes it can be hard to locate a machine or a resource. Locating it is just the first part of the battle – determining if it is being backed up / protected is the next step. Are all of your templates being backed up? Maybe you want to make sure that all of your file servers are being replicated. In cases like these, the new Global Search is a handy feature. You can start entering a description, and then you can see that object’s status as it pertains to things like is it included in any backup or replication jobs. What is interesting as well is that the search is not just limited to backup or replication jobs. You can use it to search many different item types, such as unprotected VMs or specific repositories if you have many of them. Right from the results screen, you can then create actions. 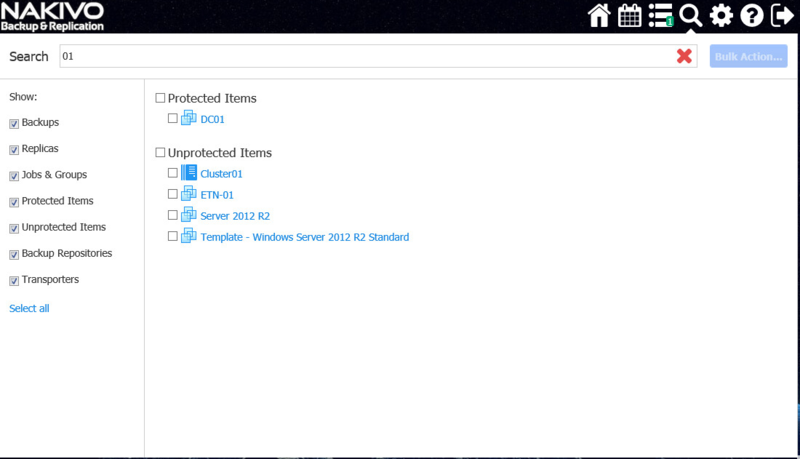 For example, I can quickly create a backup job to add all unprotected VMs to. The install of the beta is smooth and simple, as I’ve come to expect from NAKIVO. I’ve only touched on a couple of features, but these are the ones that stood out to me as I started playing around and testing it. You can find a longer list of features at NAKIVO’s site, along with a form that you can fill out to download the software. Considering that this is a point release, there is definitely a lot packed into it. Good stuff, NAKIVO. If you are interested in taking NAKIVO for a test-drive, you can download a trial from their website.